Spiders rarely, if ever, figure in conversations about the Valley of Flowers. The scenic valley in Uttarakhand’s Chamoli district is hardly the place to inspire talk about the creatures which have evoked extreme reactions among humans for centuries. But V P Uniyal, scientist at the Wildlife Institute of India in Dehradun, and his associate Shazia Quasin have long discussions on these arachnids. They are looking at spiders as bioindicators to monitor the changing environment of the Nanda Devi Biosphere Reserve. The valley is part of the reserve. “Bioindicators tell us about the health of an ecosystem just the way blood pressure tells us about a person’s health,” says Uniyal. There is a crucial difference though. We know normal blood pressure levels and the levels at which blood pressure is inimical to human health. “But indicators of environmental health are not fixed and we have to select the best indicator for every area,” says Uniyal. 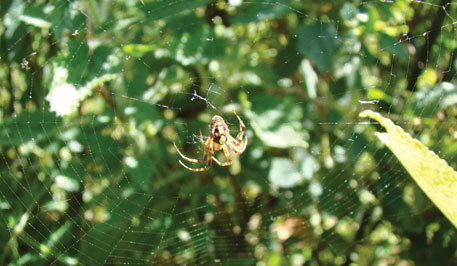 He hopes spiders could be one such bioindicator for the biosphere reserve. Arachnids are known to be sensitive to changes in the environment. We require baseline data before the insects can be used as bioindicators. But there is little information about spiders in the area. Even folklore does not have any reference of the arachnids. A survey of insects conducted by the Zoological Survey of India in 1995 listed a mere 17 spider species in the Nanda Devi Biosphere Reserve. So Quasin began with a survey, reaching altitudes not examined for spiders before. The survey documents 244 species in the reserve. Between 2008 and 2010, she demarcated zones at 100 metres distance. 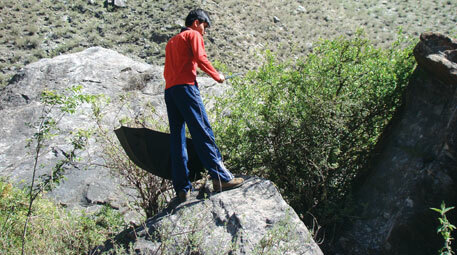 Sampling was carried along the altitude gradient in the Nanda Devi Biodiversity Reserve at three sites: Lata Kharak, Bhyundar Valley and Malari. She used a combination of five methods to catch the spiders. They included the sweep method in which a net is used to catch spiders in bushes and shrubs, the pit fall trap method in which plastic cylinders of water with detergent and sometimes alcohol to preserve the sample are used, and visual examination of litter. The maximum number of spiders was caught by the inverted umbrella method. The researchers kept an umbrella under a shrub or a bush and shook the plant four times for five minutes, as a result of which the spiders fell into the inverted umbrella. The pit fall trap too catches a lot of spiders. But says Quasin, “ all kinds of insects fall in these and you end up killing a lot of insects for no reason”. The patterns of species diversity of invertebrates along the elevation gradient have long been a contentious topic. The two general patterns that emerge are a decrease in species richness with increasing elevation and a hump-shaped relation, with species richness reaching acme at intermediate elevations and falling thereafter. “We documented a decrease in the number of species with increase in altitude,” says Quasin. This conforms to the first pattern. This is the first time researchers have sampled areas at such high altitudes. Quasin found a lot of ground dwellers and crawlers. This is significant as spider species that live in grass are likely to be affected more by climate change than those that live on trees. Invertebrates are more sensitive to environmental changes than bigger species like tigers and lions. The team found a variety of web builders in the area. Some of the genera Quasin has identified in the area are species of Chrysilla which has not been reported earlier in India. Another species like those of the genus Euophrys has also been reported for the first time in the country. Most of these newly recorded species belong to the genera commonly found in the Palearctic Ecozone—Europe, Asia north of the Himalayan foothills, northern Africa and central parts of the Arabian Peninsula. The survey also confirms Nanda Devi Biosphere’s affinity with the Oriental Ecozone—South and Southeast Asia. “We documented a total of 10 genera and four species that are new to India. Four of these are species that are new to science,” says Quasin. This information is only baseline data. “After a gap of some years we will assess the area to see if some species are lost,” says Uniyal who has been working in different parts of the Nanda Devi Biosphere reserve since 1992. As the area is protected there are likely to be very few changes due to human intervention. Only the effects of climate are likely to make a difference, he says. He also talks of a major problem with carrying out research in areas like the Valley of Flowers. Agencies that fund research, such as the Department of Science and Technology, sanction projects for only three years. That is too short, he says, especially because areas like the Valley of Flowers are accessible only for four months of a year. So, effectively, a researcher gets only 12 to 14 months in three years. Identification of species takes time as they have to consult researchers outside India as well.